WELCOME friends, family, fans and Alumni of the Kennedy Eagles Football program. Thank you for taking the time to visit our website. Please check out what the site has to offer, including the 2018 schedule, roster, player profiles, 2017 photo/video highlights and much more! We hope that you will follow our Eagles throughout the regular season as they look to capture a third consecutive Brass Division title! In 2005, Coach Sarlo dedicated an award to honor the memory of his close family friend, Stephen Rockwell. 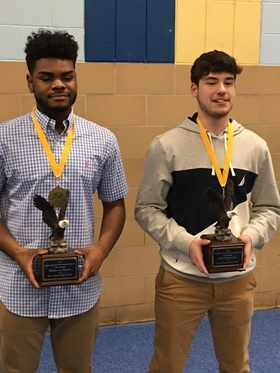 The Stephen Rockwell Memorial Award, known as the 'ROCK' is awarded to the player who best models the principles of the Foundation of the Kennedy Eagles football program, TEAM, COMMITMENT and HARD WORK. The 'ROCK' makes the commitment to work hard for the success of the TEAM. He leads with his actions not only on the playing field but also in the classroom. Above all, he is the player who can still crack a smile and make others laugh, even after an exhausting practice or after a tough loss on game day. He is passionate not only about football, but about life itself. Stephen Rockwell had those same passions. A former football player and 1982 graduate of Kennedy, Steve was killed in a motorcycle accident in 1988. He left us way too early, but during his time on this Earth he made such a profound impact on everyone in his life. One of his favorite songs was Bobby McFarrin's 1988 hit, 'Don't worry, Be happy'. That is exactly how Steve lived his life. No matter what life threw his way, Steve never let anything or anyone bring him down. He made everyone laugh with his wonderful sense of humor and he made everyone smile with a tremendous smile that was contagious! The two student-athletes honored with the 2017 Stephen Rockwell Memorial Award are juniors, Jake Desjardins and Rhakeem Henry. As only the 2nd and 3rd juniors chosen for this honor, Jake and Rhak earned the 'Rock' by their actions on the practice and playing fields. Putting the team first, they both made the commitment to work hard in practice every day. Both battled through the physical aspects of the game never missing a practice and playing nearly every play on varsity gameday. Jake and Rhak led by example off the field as well. They are both very good students. Rhak was inducted into the National Honor Society this spring. We look forward to their return to the program as seniors and their hard work and dedication to the Kennedy Eagles football program. Strength & Conditioning starts Monday December 3rd! Off-season conditioning starts Monday December 3rd. All student-athletes interested should meet in the JFK Boys' locker room immediately after school. Sessions run Monday, Wednesday and Friday from 2-4 PM. Students MUST have a current City of Waterbury sports' physical on file with the JFK School Nurse's Office. "Think training is hard? Try LOSING"
CALLING ALL friends, family, fans and alumni of Kennedy, Croft and Leavenworth High Schools! The Kennedy Eagles Football program invites you to join the 2018 Eagles Endzone Club, the organization that provides support for the Kennedy Eagles Football team. All who join the Eagles Endzone Club will have their names entered as part of the Honor Roll in our Varsity Gameday program. They will receive a certificate of membership, 2 free passes to any EAGLES' home game at Municipal Stadium and the necessary documentation for their tax records. Members from the business community will have their sponsorship information placed in the Varsity Gameday program and their business advertisement will also be highlighted on the Sponsors' page of our website. This allows our sponsors to reach out to those from the Naugatuck Valley region who attend our games and who visit our website. What better way to honor the glory of our past, recognize the players of today and ensure the success of our future? Spread the word to family and friends who have attended or played football for Kennedy, Croft, or Leavenworth High Schools, and to anyone who is a fan of the great game of football. Please feel free to contact Varsity Head Coach, Chris Sarlo at 203.574.8150, or sarlo@att.net. Thank you for your consideration. I am not sure exactly what I want to write in this post so it may ramble on, but I ask for your patience. Today, a former player visited Kennedy to inform me and others that Dariel Perez passed away on Tuesday. He died as the result of a one car accident late Sunday night. I don't know any more details about his death, but I would like to share more about his life. Everyone in the football program knew Dariel as 'Rudy'. It was such a fitting name for him too. He played for our program from 2007-2010 and he graduated with the class of 2011. He served as a team captain his senior year and earned All City Defense honors for the 2010 Varsity season. The best way to describe 'Rudy' as a player will sound cliche, but he always gave 110 percent! When guys were dragging a bit in practice or down in a game, he always kept moving at top speed. He was never an all state caliber player, but 'Rudy' was ALL HEART! I never coached anyone with more courage and mental strength than 'Rudy'. His performance on the practice and playing field was so inspirational that I named an end of the year award in his honor. Each year since 'Rudy' graduated, we have awarded the player with the most heart who NEVER quits with the Dariel Perez 'Rudy' Award. We will continue to do so for as long as I am the Head Coach, but sadly now it is a memorial award. The photo that I have attached with this post gives the ideal image of 'Rudy'. As a sophomore, he was one of only a few 10th graders who suited up and played in the 2008 NVL Football Championship game. Take a close look at his helmet. Anyone who knows the game of football recognizes that this kid played hard and you can tell that by the 'war paint' on his helmet. 'Rudy' worked just as hard off the field as well. He was always in the weight room trying to increase his strength and serving as the model for other players throughout the off-season. Even more important than his football contributions, were his contributions to the Kennedy school community. He got along with everyone. He made everyone around him a better person. He was a hard working student who always took the time to help others. I had him as a student in class and I witnessed the same level of commitment and hard work. The Kennedy community, the city of Waterbury, this state, this nation and the world, lost a great young man. I think that I can speak for all of my staff, his former teammates and even the current players in the program when I say that 'Rudy' will be missed. #8 will always hold a special place in our hearts. We offer our condolences to his family and we want to thank them for allowing us the opportunity to spend time and share life with their wonderful son.